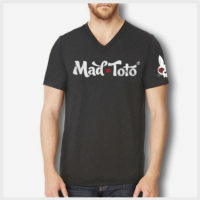 As timeless as traditional tattoos, this is a dark heather grey lightweight baby doll t-shirt with our Toto Flash design. This women’s essential tee fits like a well-loved favorite, featuring a scoop neck & short sleeves, designed with superior combed and ring-spun cotton with shoulder taping. The amazing Team Toto screen prints all our shirts by hand and in house.